Recently, I was giving a presentation about participatory techniques at an art museum, when a staff member raised her hand and asked, "Did you have to look really hard to find examples from art museums? Aren't art museums less open to participation than other kinds of museums?" I was surprised by her question. In my travels and research, I've seen all kinds of museums be incredibly successful--and incredibly uncomfortable--with visitor participation. While it's true that art museums have some particular challenges, so do all kinds of institutions in their own ways. This post outlines what I see as the opportunities and challenges for different kinds of museums in pursuing participatory visitor engagement. OPPORTUNITIES - History museums are in many ways the best-suited for visitor participation. They are frequently about real people's stories. As cultural anthropology has swung away from a vision of authoritative history and toward the embrace of multiple perspectives, there is potential for those stories to come from all over the place, including visitors themselves. For this reason, I see history museums as best-suited for participatory projects that involve story-sharing and crowdsourced collecting (e.g. MN150). Because of the incredible popularity of genealogy as an activity, history museums are also excellent places for visitor-generated or -supported research projects (e.g. Children of the Lodz Ghetto). Finally, because of their social content, they are good places for community dialogue programming and comment boards (for example, consider the Levine Museum of the New South's extensive use of sticky notes and talking circles). Everyone can have her own personal experience of history. CHALLENGES - Despite their support for multiple perspectives, history museums feel strongly about accuracy and authenticity. They also want to avoid stories or perspectives that reflect hateful or offensive views toward other people. Validating and moderating visitors' stories or contributions is often a top concern in history museums. So is maintaining a narrative thread that is intelligible and enjoyable to visitors. Balancing multi-vocal content with a comprehensive narrative can be tricky. Finally, some history museum staff members feel that they should not be dealing with contemporary social issues or that they are unable to facilitate dialogue on contentious topics. OPPORTUNITIES - Art museums are well-suited for creative visitor participation. They show the creative process, and many visitors may be inspired to create their own art in response to that on display (e.g. In Your Face). While art historians and curators may have their own sense of what interpretations of art are most accurate or valuable, it's generally accepted that everyone has his own experience of art, and that individuals' different interpretations or preferences are acceptable (which encourages some museums to invite visitors to write their own labels). Finally, many art museums do fabulous, highly participatory projects that are led by participatory artists who work specifically in the realm of dialogue or active social participation. CHALLENGES - Art museums have more significant separations between education departments and curatorial departments than other types of museums. This means that an activity construed as educational (i.e. write your own label) often cannot be placed in the gallery if it is perceived by curators to distract from the aesthetic experience of connecting with the artworks. Ironically, art museums often present the most radical participatory experiences for visitors--but only when led by an artist, not by internal staff members. There is also a strong bias in some art museums against amateur content, which prevents some institutions from encouraging creative participation by visitors. OPPORTUNITIES - Science museums and science centers have a long history of interactive display techniques, which makes them naturally suited to encourage other kinds of active visitor participation. They also have a general visitor-centered "you be the scientist" approach, which elevates visitors' own opinions, actions, and contributions in the context of the museum experience. Finally, they are commonly used by school and family groups as learning places. These attributes makes science museums and science centers ideal for participatory projects that are collaborative and action-oriented. Many science centers support participatory design challenges, citizen science projects, and nature exchanges that encourage visitors to engage personally and socially in doing science. Some science museums also present dialogue-based programs and exhibits around contemporary science issues, like race, wealth disparity, and climate change. Several also offer adults-only events or venues to encourage older visitors to engage with tough topics in modern science. CHALLENGES - Unlike history museums or art museums, science institutions do not value multiple perspectives on basic interpretation of science. Theories like evolution and the laws of thermodynamics are not open to visitor reinterpretation. Additionally, the family-oriented focus on fun and shared learning at science centers leads some to shy away from controversial topics or visitor experiences that might be perceived as too complicated to integrate into a family visit. There is also the concern that visitors' contributions are more likely to be off-topic or comment boards used in entirely inappropriate ways, especially by school groups. Visitors are rarely engaged in exhibition development or content production as they might be in art or history museums; participation in science centers is often focused narrowly on teens and young adults who are engaged in formal internships or staff positions. OPPORTUNITIES - Like science centers, children's museums are highly interactive and visitor-centered. There are many opportunities for visitors to make things both to share and take home in the context of a visit. Children's museums often encourage visitors to explore new ideas and develop narratives around their experiences, and institutions frequently showcase visitors' stories and creations. In some cases, professionals develop exhibitions or shows with children's participation, as in Capital E Theater's opera, Kia Ora Khalid, which was based on and developed with young immigrants. Some institutions encourage visitors to make personal pledges relative to tough topics, like prejudice, personal health, or environmentalism. CHALLENGES - The biggest challenge to visitor participation in children's museums is concern about privacy. Most children's museum staff are not comfortable encouraging visitors to document each other (i.e. take photos of each other's kids), asking for personal data about children, or encouraging children to approach strangers (unsurprisingly). Additionally, many museum staff members assume that family and young visitors are not able to make substantive contributions as participants due to their level of ability and availability. While the delineations above are by museum subject matter, there are also significant differences between participatory opportunities in large and small museums. Small museums are more likely to be community-oriented and to be comfortable incorporating visitor-generated content without feeling that it disrupts the overall design of the institution. However, small museums are also less likely to have staff support to maintain and sustain participatory projects over time. While large museums are often beleagured by endless committee meetings that can hinder the potential for creative new projects, when all the dotted lines are signed, the projects tend to affect more visitors than those of small museums, and may be better funded over time. Frankly, I think small museums win out on this one--ultimately, they are less focused on authoritative image than large museums and more likely to enthusiastically embrace community involvement. What kinds of challenges and opportunities exist in your own institution? What types of institutions do you see as most open and closed to participation? Yes yes yes. I work at a small history museum and these are exactly the troubles we have with interactive projects. Collecting community stories is a wonderful thing to do, both for visitors and staff (tea with retired ladies as they tell you stories? Don't mind if I do! ), but it's very challenging to keep stories topical and to sustain projects over time. My museum is a historic house which brings an additional set of challenges. Where do we present these stories in the context of a domestic space? Are they eternally relegated to the visitors' center? To our website? Regarding the small vs. large institution note- I work in a pretty small institution, and had always presumed that when it came to visitor participatory experiences, that large institutions had the upper hand. I can't remember the last time I participated in something in one of the local small institutions, but I do remember writing down and sticking up on the wall what my fears are at the Canadian War Museum last time I was in Ottawa (small children). I guess we all want what we don't have, huh? I have a particular affection for those small museums and think they also have another advantage...they can adapt, or even abandon, when things aren't working right without having to go through another huge round of all those meetings. Although it's not always found together, hooray for small and flexible! I think one area where history museums and art museums are liable to overlap challenge-wise in the tradition that the museum is supposed to be about the stuff first and foremost -- the collections. History museums have been slow to recognize that stuff (particularly the more prosaic stuff) is usually more interesting when seen in the context of a story. Quite often history museums are stuffed with representative collections that have few, if any, stories. Art museums have a tradition of connoiseurship that makes it difficult for them to see the value in sharing interpretation with the public in substantive ways. It is not an exaggeration to say that participation in these instances can actually be perceived as a threat. I find it funny how museums that have an obvious, built-in population (hobbyists, professionals, etc) interested in their museum (mechanics at the automotive museum, scuba divers at the local aquarium, postal workers at the Postal Museum, quilters at the Textile Museum, etc) don't often have a participatory model in place with which to relate to that natural audience. Maybe it's easier to reach out to a family with no connection to the topic and invite them to pretend to be mechanics from the 1920s than to actually say "Hey group of people with expertise in this field, here's a participatory experience for YOU!" Folks at the Postal Museum tell me all the time "my great grandma was the postmaster of her town and..." They fax me newspaper clippings related to their family's postal history, they show off badges and mail bags, they ask "Do you have anything about the Nevada postal system here? We're from Nevada and have three generations of letter carriers!" Yet the online project designed to collect their memories (sort of an online Story Corps) is the slowest in coming together and not well funded at all! What barriers are keeping us from making those connections to folks who ought to be our built-in fans? Are we trying not to look exclusive? Is there some risk I'm missing? I think it's fear of amateurism. But you have a great point. John Falk calls the people you are describing "hobbyists," and one of the strange ironies is that many more general museums of art or history presume they have a lot of hobbyist visitors with deep knowledge, when in fact there are very few of those folks walking through the doors. I would think for an institution with a large hobbyist population, there is HUGE opportunity for participation--they already have knowledge, enthusiasm, and some desire to contribute! The challenge is to find ways for them to contribute meaningfully--ways to see their stories and objects as positive enhancements instead of annoyances. The answer to that is different for different institutions, but if you can find a project that is worthwhile to the institution AND to your enthused hobbyist population, you can be successful with participation. Hmmm, Erin and Nina, I think those hobbyist people *are* already at the museum participating- but as volunteers, not visitors participating in a programme. I work at a museum on an air base and there are a lot of retired service members who didn't leave the region when they retired. They're here right now, restoring an airplane for us. They don't want to come once or twice with the kids and repair something imaginary, they want to have a place to go to regularly and use those skills. I think the same happened when I did some volunteering at the National Railway Museum in York, UK. There aren't a lot of participatory programmes that were going on in the museum per se, but they had a regular dedicated staff doing restorations on engines. I bet this is true of other transport museums, at the very least. jgoreham - agree about many hobbyists being volunteers. we had my son's 3rd birthday party at the fire station museum in sheffield which is run by volunteers most of who are retired fireman. In terms of art museums - i think Nina's analysis of the barriers and opportunities is spot on. i'm working on an article on this subject currently and will be interviewing various people from UK visual arts sector about the barriers and opportunities. When I've discussed this issue before with those working in visual arts we commonly find excellent participation in the education department (off site in tucked away discreetly where visitors can't see it) . For those of us working with contemporary art i think it's even more pronounced - in the world view of many curators (and artists) it would be inappropriate to allow others' views or responses in the same space. Of course - fortunately - there are also many artists who embrace participation as central to how they work too. As a history/archaeo small museum administered through a university, I concur completely on the small vs. large museum piece. I thoroughly enjoy that with our staff of 4 full-time, 3 Graduate Assistants, occasional interns, directed studies, etc. that from idea conception to implementation can be a matter of days. The lack of bureaucracy allows us to take full advantage of student expertise that might be around only for a semester. Our new Assistant Director comments often how one of the very real perks in working at our Museum is not having all of her creative ideas end up in a black hole, as in her previous employment. The downside we experience is too much of a shotgun approach because we rely so heavily on skills of transitional folks. There is a constant tension between being true to mission, available resources and stifling creativity. The tension is good, but we need to remain vigilant to the issue. Thank you everyone for the inspiring discussion. Sharing from my own experience at a medium size contemporary art museum which holds experimentalism and hospitality as key values - quality participation is not easy to reach and indeed depends a lot on the openness of curators and artistic directors (meaning - not only on the dedicated mediation teams). A successful example to call in this context is the Kijk Depot (Dutch for "Viewing Depot") in which visitors were invited to pick a work out of the collection catalogue they desire to see on show, in exchange for submitting a motivation for their request. every two weeks a new exhibition was installed in the Kijk Depot gallery, curated by individual visitors who received a letter to their home inviting them to come enjoy "their" work in the museum. The relevant motivation applications were displayed in the gallery alongside the works serving as the curatorial text. This project for example was developed on purely curatorial basis and derived from the wish to gain the public more access to the "hidden treasures" of the collection and then developed as an experiment in participatory curating. Maybe to mention two experiments we are about to kick off really soon (both have to do with subjects mentioned here by others) - During the next installation period in the museum we will invite visitors to experience the museum backstage, exposing the usually hidden activity of transport and installation. We would like to use this moment to expose the different views museum employees have on art (the technician view, the conservator's..) in order encourage the visitors to feel their view is valid as well. As part of the Transition period we will invite specific interest groups to meet with museum professionals - for example - book collectors to tour the museum archive and exchange impressions with the archivists, we aim to promote the idea of the museum as a knowledge bank not exclusively for art professionals. This program will mean extra pressure on the museum infrastructure and employees during its most tensed period so I'm really curious to see how this will go... The next challenge we are facing - interactive tagging of art works inside the galleries. We started to use tags as alternative meaning generators last November and these were received very positively by the visitors. So far tagging was static - additional information contributed by the curators. Now it's time for the next stage - inviting visitors to tag artworks themselves, reacting or negating the previous information given. Here I can directly connect to what was said here before regarding the collection being the main asset of the Art museum. The challenge is to get visitors to 'own' the collection (in Europe most museums are actually publicly owned..) and use it as a modular tool for reflecting on identity and cultural issues. With interactive tagging we hope to achieve 'multiple players and multiple meanings in the museum domain'. 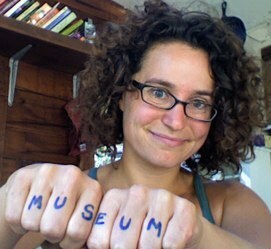 Participation is a great thing in museums, when it works! I have found that it works better when there is a natural link to the content of the exhibition. It is a part of the exhibition and your contribution will be displayed, I as a visitor get excited and feel that what I do will actually matter. I am currently working in an art gallery in Puebla Mexico where we are working with one of these participatory projects. hds - i was really interested to hear your example as i'm working on an article about participation in contemporary art spaces. it sounds like a great project - but your link didn't work. could you re-send? Hi all. I wanted to thank everyone (esp Nina and jgoreham) for your thoughts on this post and subsequent comments. This Saturday we're doing a panel discussion exploring and commemorating the 40th anniversary of the 1970 postal strike. Postal union folks have come OUT OF THE WOODWORK to RSVP for the program. Most of the postal workers calling have been so excited that we're celebrating their history. At one post office, they passed the phone around to all the employees so everyone could sign up. But many have also admitted that they didn't even know that there was a Postal Museum--and these are folks who clearly have an interest in postal history. It's great that this program gave the audience the opportunity to clamor for participation and the museum the opportunity to see how numerous and passionate this audience really is. This happy coincidence is making me re-think how our efforts are perceived by this particular audience and how we can do a better, more strategic job of this in the future. We plan to collect their contact information for future oral history projects and give them a coffee reception so they can swap stories together... but we aren't quite reaching the level of participation I think these folks would be even more thrilled to be part of. In any case, being able to actually meet this audience is going to be a very good thing. Wow Erin - good luck! I hope you can take the opportunity to hear from them about how they'd like to participate in a postal museum and what it could be for them. Have a great program and thanks for sharing! Thanks for this ... as the curator of programs for a soon to open (May 2011) regional social history museum in metro regional Melbourne (Australia, thank you, not Florida) I could not agree with you more. Many museums are ... well frankly ... artefacts themselves. Personally I subscribe to the Antiques Roadshow aesthetic - the object is darn good but the story is great and when the visitor can share their story too? Fantastic! As a museum we are focused on the stories behind our objects and gathering the stories of those who live, work and play in our region. Sharing stories is our business, it is what connects us. As museum professionals we are storytellers, engaging directly with our visitors through story sharing programs – especially when collecting and considering objects to add to the collection - is the only way to do this. This is all great food for thought, thanks for posting such an insightful article. I'm an intern working on a project at my local zoo to create a display/area for visitor participation, and I've noticed that most discussions of visitor response areas have to do with history or art museums. Each time I hear about one museum's innovative approach to eliciting visitor responses, I try to think how that would work in a zoo setting, but zoos present challenges that not many other museums have. For one thing, we're outdoors, so a computer kiosk or other digitized display wouldn't really work. We've also found that visitors are highly destructive (perhaps the zoo brings out their wild side? ), even going so far as to remove signs and take them home; unfortunately, this means we have to be very careful about constructing a response board that visitors won't take apart. For the most part, I think our challenges fall somewhere between a science museum and a children's museum, but I thought I'd ask if anyone has any stories they can share about creating visitor response boards in zoo settings. Also, does using social media for participation present a challenge to some museum types more than others? Do any of you work at any small museums or know any small museums that have successfully endured through a crisis, transitioned well with changing societies, or been successful amidst a failing economy? Could You Split Your Membership?